And we're off! Behind and with several crop options out of the question as the days get warmer, CK and I cast aside all thoughts of laying around, farmer's markets, street fairs, or anything else and took full advantage of the past three days of glorious sunshine here in P-Town. The yard already is looking better. We still have a lot of boxes inside, but it was so beautiful & warm this weekend that we both really wanted to get vegetables going. It was good spending the weekend feeling like my health was returning and working hard. Weeding out the beds reminded me a lot of work duty during April's sesshin and I was smiling remembering the little interactions with my work partner. Entire conversations based upon a slight smile, small bows, tired sighs, and occasional bursts of quick laughter.... oh, and one very small victory dance. We got a bit carried away at Portland Nursery picking out vegetable starts. This explains the numerous cucumbers - we both started just picking them out instead of agreeing upon how many we were getting. There's going to be a whole lot of cherry tomatoes in our future too. I'm thinking gazpacho. CK's never had it. I've never made it. I think it would rock with all of our veggies. Maybe another victory dance will be necessary? We are a tad nervous that all these tomatoes are going to show up the week we're gone for my birthday. Perhaps we'll have to have designated veggie pickers from the sangha come over and help themselves to some? Oh, and are we ever aching! As the man sang, "I ache in the places where I used to play." The 2007 Fall Ango Zen Community of Oregon reflected upon a teisho from my teachers' teacher, Maezumi Roshi. The particular teaching we studied was entitled, "Close the Gap Between Yourself and Yourself". Hogen suggested that I really look at how to cultivate pride and appreciation for my accomplishments. It struck me as "pretty un-Zen" at the time. When I talked with GM about it during that Ango she said she wasn't surprised I didn't get it. One of the things she notes is an area that could use some improvement is my ability to really appreciate my accomplishments. I downplay my achievements all the time. Really most of the time it doesn't feel like I'm doing anything extraordinary. It just feels like I'm chugging along, humming & drumming through each moment. So I struggled with this topic and a few weeks into Ango I went back to Hogen and asked for help. It struck me as somewhat comical that I was asking my Zen teacher just how one goes about cultivating pride. He suggested that I consider the task of digging a 100 foot ditch, irrigation or some such thing. He said that when one is digging a really big ditch it is necessary to turn around after the first 5 feet and recognize the effort that has gone into that work. Not to just keep feeling overwhelmed by the 95 feet yet to be dug. GW agreed that I spend most of my time worrying about the other 95 feet. CK, after she got to know me weighed in with her agreement of this assessment. This spring for some reason I'm finally starting to get it. In most things in my life I've been a quick learner, adapting with speed to new things. Sometimes Zen makes me feel like a rather poky student. My doctor, the same physician I've had for over 15 years, called me "skinny" when he saw me last month. He checked out my blood pressure & pulse statistics, shook his head and smiled. Maybe it is that his reactions are so candid, so human that it is finally sinking in that my weight loss is something unusual. There have also been friends and teachers who have been telling me again and again that the changes I've made in my life, have maintained in my life, are unique. This takes me to the berry patch at Great Vow Zen Monastery. Last week at sesshin my work duty was out in the gardens. In particular, the berry patch where another retreatant and I had been asked to remove pepper cress. 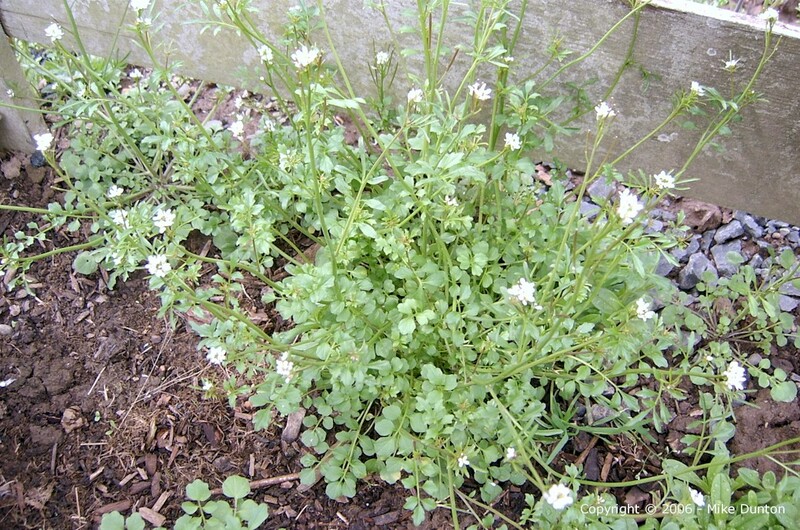 There was a lot of pepper cress, it is very successful at sending seeds spraying out in all directions. It seemed like an enormous task. The first work period I just sat down at the far corner and started pulling pepper cress. By Friday I realized I'd cleared nearly half the berry patch! I stood up looking at the ground, cleared of the invasive weed (although it is edible). I nearly started to laugh as I stood there feeling a great deal of pride in what I'd finished. On Saturday my silent partner and I finished the last 3 feet in a great flurry of weed-pulling after the clean up bell had rung. We closed the gate, laughed together merrily, and I performed a small celebratory dance, waving my 5 gallon bucket in the air. We grinned at each other and continued to chuckle while emptying our buckets before heading back in for more zazen. I still feel a little uncomfortable with this new sensation. But I can feel the way pride is good. That it is OK to look at something I finished and really let myself feel the accomplishment, the appreciation.